An Inkling using an Inkrail. The Inkrail is a form of transportation and mechanic in Splatoon and Splatoon 2. Inkrails appear to be long, thin ropes of ink that connect various platforms in Octo Valley. They are tethered to such platforms by slightly larger bulbs, serving as entry points for Inklings. The bulbs must be activated by hitting it with ink, before the player can use the rail. When in squid form, Inklings are able to travel back and forth along Inkrails as they please; however, if an Inkling jumps off or uses its humanoid form while on an Inkrail, they will fall to their death. Agent 3 can jump higher than possible whilst moving across an Inkrail. 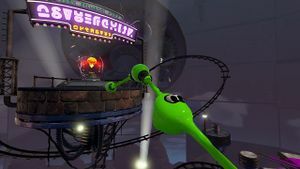 No Inkrails are found in Octo Canyon, due to being replaced by the similar Ride rails, but they have instead been introduced into the multiplayer as a new mechanic. They work similar to how they did in the first game, but after the bulb has been activated, the ink capacity will visually decrease until it empties, when players cannot use it again, until they hit it with more ink, refuelling the bulb. It can only be used by players of the same ink color and players with other colored ink can hit it until it changes to their teams color. They last around fifteen seconds without shooting them to last longer. Inkrails make a return in the Octo Expansion and allow Agent 8 a similar function to in the original game. They have a more prominent use by having Agent 8 get around places easier and find better ways to splat Sanitized Octarians. A lime-colored Inkling using an Inkrail in Octo Valley. An activated Inkrail in Flooder Junkyard. Inkrails allow Inklings to travel above the map on Moray Towers in Splatoon 2. This page was last edited on 6 April 2019, at 21:50.